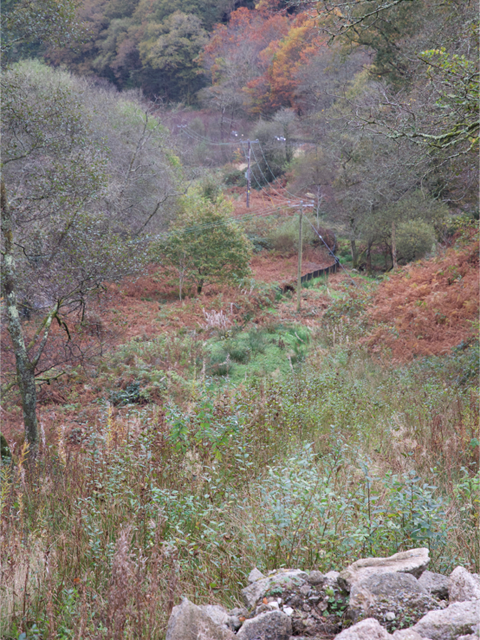 The Corris Railway is actively pursuing a southwards extension towards Machynlleth, with the aim of extending the line to Tan-y-Coed, midway between Esgairgeiliog and Llwyngwern and some two and a half miles south of Corris and is the site of Forestry Commission managed site with facilities including a picnic area, car park, toilets and designated number of trails through the woodland and along Cwn Cadian. As always, this is involving lengthy negotiations with the authorities, not least due to the line south of Maespoeth running immediately adjacent to the A487 trunk road. The Corris Railway owns the land south of Maespoeth up to, but not including, the former crossing keeper’s cottage at Pont Evans. 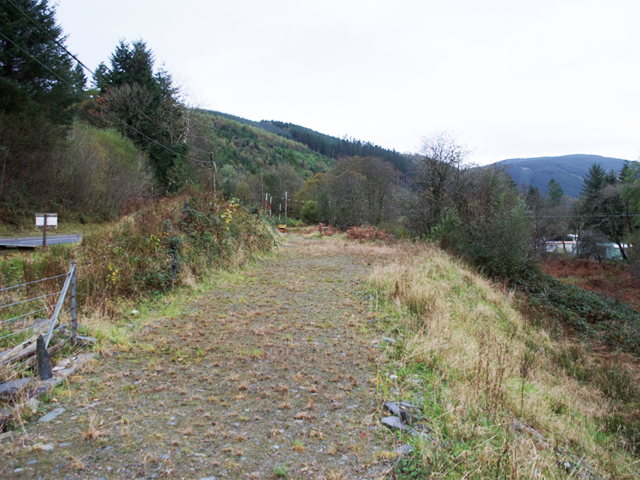 In the early days of the society, before the Railway was in the position of being able to affect the decision, the A487 was straightened across the track bed and this will necessitate the building of a new embankment to join the current rail head to the original track bed. About six hundred metres long, it will incorporate a bridge over the (little) river Goedwig and built on land that is owned by the Corris Railway. In 2015 work began to enable the southerly extension to join up with the old trackbed. At the southern end of the embankment the Railway has already done the necessary ground work to join the old with the new. The track on the new embankment will need to follow the steep slope of the original Maespoeth Bank with an average gradient of just over 1 in 30. 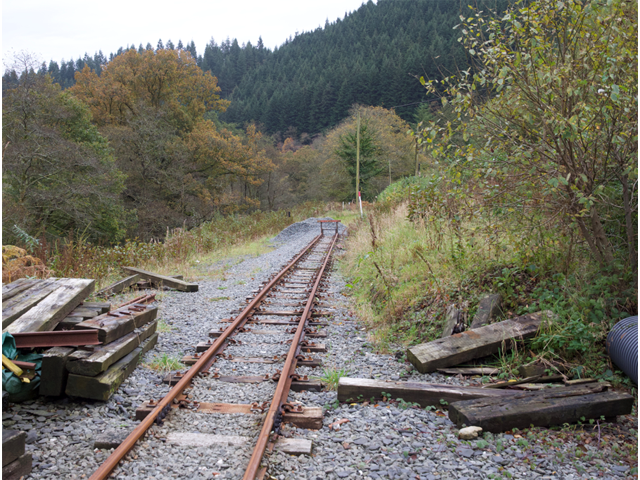 It has been our intention to build the track through this point, cross the road at Pont Evans and then through Esgairgeiliog to a new station near the car park at Tan y Coed. Outstanding issues relate to the rebuilding of the Railway once it joins the original track bed and while there are good reasons why rebuilding all the way to Tan-y-Coed has been the target for a number of years it has been decided that a phased extension would make better sense. As a result of this decision, the Railway should be able to proceed with the building of the embankment and extend the passenger service to a new run round loop on land near to where it joins the old trackbed. Nearly all the permissions required to build the embankment are in place but investigations into the situation with regard to the requirement for planning permission to run passenger trains on our new formation are still ongoing. There should be plenty of time to sort this out while we raise money and build the embankment. The new destination will be known as Goedwig South and at the present time we are not planning to make this a station with facilities for passengers to disembark. 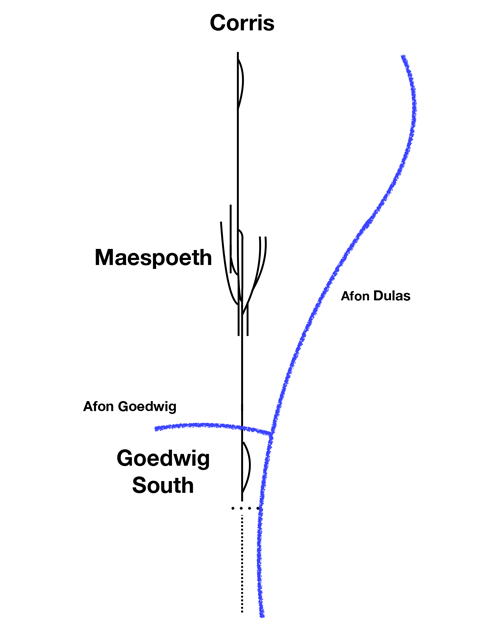 The service will run, as at present, from Corris to Maespoeth with the train carrying on to Goedwig South where the engine will run round and return the passengers immediately to Maespoeth. How will this affect what is offered to passengers? Well it will nearly double the length of line and give passengers the opportunity to experience a small engine working up one of the steepest banks on preserved railways in Britain. Furthermore, it will greatly enhance the experience for the operational staff, with the challenge of running up (and down) the bank in the variety of conditions that Corris is well known for. There are other benefits of extending to Geodwig South. These include, proving to politicians, locals and funders that we are capable of moving forward and the potential to both raise morale of the of existing membership and to attract new members. So, what will happen next? We are still finalising the permission from the Welsh Government to start the building of the embankment. We are assured that this will not take long however there is nothing formal to stop us starting the work on the ground. This final hurdle is, however, not sufficient to stop us from starting to move forward on other fronts. We can, and will, start to prepare tender documentation and explore, with professional help, the funding strategy that we should follow. We do have some monies in hand earmarked for the embankment, but these amount to tens of thousands of pounds rather than the somewhat higher figures that will be required for a scheme such as this.